Casa-Nica assisted the Zemora Teran Foundation deliver a new donation XO laptops to a school on a small island on the Granada Islands in February 2011. We met up with the FZT team on the highway outside of Masaya on their way down to Granada and travelled down to small port that services the islands. We then took a boat with all the volunteers and staff and computers over to the school. There were speeches from the head of FZT, the Mayor of Granada and the Head of the school. Then it was time to give out the laptops. After they got their laptops it was time for them to head home. 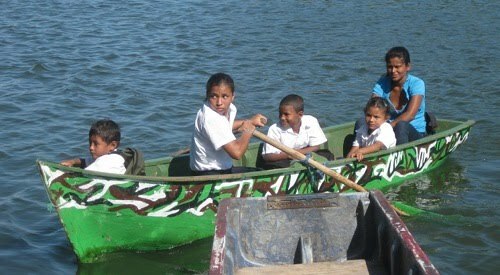 They kids living on the islands learn to use boats from a very young age.